Dawn Wolf is a joatmom—jack of all trades master of many. She has a Bachelor of Science degree in biology with a chemistry minor collecting dust in a drawer and wishes it would magically turn into a music degree. Homeschooling has been her main focus for the past 16 years, but she manages to squeeze in musical adventures with MPK Christian Celtic Band now and again where she uses her many words, flutes, and whistles to amuse and challenge audiences of all ages. Our Father’s House Christian Community Church is an extremely important part of her life where she serves as Uttermost Ministries secretary, (www.facebook.com/uttermostministries) church secretary, VBS director, Sunday school teacher, and children’s church teacher. She is committed to loving and serving Jesus for life, no matter what, until He calls her home. 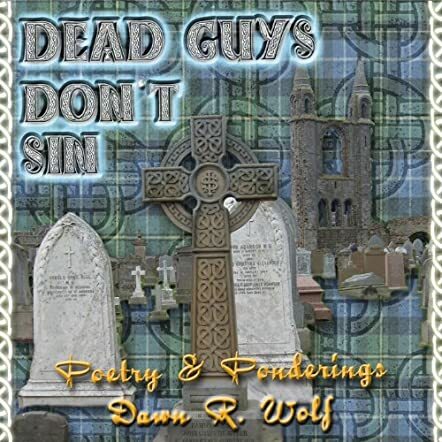 Dead Guys Don’t Sin is a collection of poetry, prose and music by author Dawn R. Wolf along the theme of Christian devotional writing. Each work begins with a quote from the Bible, which is then followed by a short commentary by the author that introduces the concept. The poems themselves take the form of verses, prayers and songs, all centering on the theme of salvation and the experience of giving control of your life over to Jesus, and trusting in that control. Many of the works are also deeply personal to the author, including photographs from her life alongside the verses to exemplify the connections between her everyday life, her art form and her faith in God. When reading Dead Guys Don’t Sin, it quite often felt as though I was sitting in church. To many readers of devotional Christian works, I’m sure that will be exactly what they’re looking for in a piece like this; for me, it was just a little over the top at times. Having said that, author Dawn R. Wolf shares a joyous piece of her life in this work that sparks with a lot of positive energy and highly personal reflections. It was interesting and uplifting to peer into someone else’s life in such a fresh and innovative format of writing, and I think the text as a whole is beautifully presented. Overall, I’d say Dead Guys Don’t Sin will reach out and lift the souls of many Christian readers looking for fresh, positive ways to express their faith.